"I cut out processed foods, caffeine and alcohol." By The Numbers: 142 pounds at my heaviest, currently 115 pounds, for a total weight loss of 27 pounds. The Weight Gain: I always managed my weight very well and had no issues growing up. But the weight gain had started after I had my second baby. At this point, I had tried various eating plans and diets like the Atkins diet and Dr. Oz's eating plan. Final Straw: "I was diagnosed with high blood pressure at 37. My doctor told me that I might have to go on medication and this made me realize I needed to do something about my health, weight and diet. I don’t believe it diets. I believe in eating clean nutrient-dense meals. That’s where I found my success and something that is sustainable." I was coming up on my 40s and I was determined to enter that part of my life looking and feeling better than ever. The Plan of Attack: I made going to the gym a regular habit and I focused more on the type of food I was eating. I met up with fitness industry professionals who were educated and skilled in nutrition. 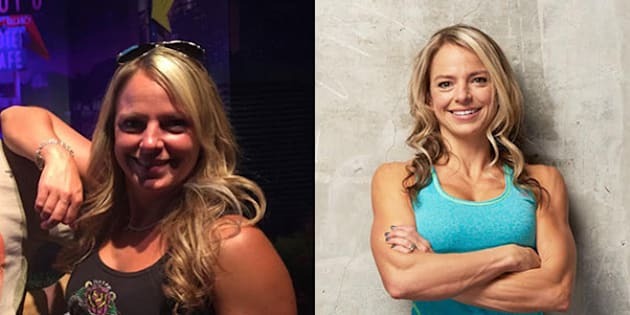 They helped me create a plan that consisted of nutrient-dense food and taught me how to meal plan and eat properly. This approach was something so far from a diet — it was a nice lifestyle of eating. It took a total of 11 months to lose the 27 pounds and I have maintained my weight ever since. The Exercise Factor: I joined Steve Nash Sports Club and trained with one of their trainers, Adrianna. I thought I was really good fitness-wise until I trained with Adrianna and she put me on a plan. She accelerated my fitness to a whole new level. I wanted to complete in the Popeye’s Fall Classic in Masters Bikini. I wanted to get between 110 to 115 pounds. These days I go to the gym six to seven days a week. I love the gym, it’s one of my happy places. I work out 60 to 90 minutes a session, combining weights and cardio. I love fitness classes and hiking outdoors as well. The Food Element: I started eating lots of good proteins like chicken, turkey, cod, halibut, tuna and eggs. I also ate loads of green, yams, sweet potatoes, spaghetti squash and coconut oil. I cut out processed foods, caffeine and alcohol. The hardest adjustment was making it consistent and not deviating from my plan. Even when there were social events or other activities that came along, I stayed strict to my plan. I focused on nutrient-dense food, and balanced meals six times a day instead of counting calories. I don’t believe in diets. I believe in eating clean nutrient-dense meals. That’s where I found my success and something that is sustainable. It's a balance between what goes in and what’s burned off.."
The Current Day-to-Day: I get up at 4 a.m. and I'm in the gym by 5 a.m. I am a working mom with a growing career. I leave for work by 7:30 a.m. and I am home around 6 p.m. After that, I help my kids with homework or pick them up from their sports, and get ready for the following day. In our downtime we like to hang out together as a family. I continue to eat a clean nutrient-dense balanced food plan. I enjoy a meal or two off my plan here and there. but I stick to an 80/20 rule. I also continue with my weight training and cardio. It's a balance between what goes in and what’s burned off. I am the most proud of accomplishing my goal. I feel better than I ever have felt and I’m ready for my 40s! I won 2nd place at the Popeye Fall Classic in Masters Bikini and will compete again at the B.C. Provincials in July. My weight loss advice? Just do it! Find yourself someone who will genuinely be by your side and assist you in accomplishing your goals.